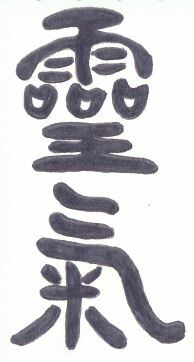 Reiki (pronounced Ray-key) is an ancient Japanese energy healing technique that was originally used for spiritual development and is now used today for stress reduction and relaxation which helps to promote your body’s ability to heal. It is based on the idea that a “life force energy” flows through us and is what causes us to be alive. If one’s “life force energy” is low, then we are more likely to get sick or feel stress, and if it is high, we are more capable of being happy and healthy. A Reiki practitioner does not actually manipulate the energy or heal another; rather we create an energetic space to support the self-healing process. A Reiki practitioner has a high energetic vibration when connected to Source. Since all energy eventually has to match, the client’s energy rises also and that heightened state allows the body to be able to take care of itself and balance whatever is imbalanced in the body. In reality, the Reiki practitioner is not doing the healing – he or she is simply a conduit of energy that allows each individual to be responsible for his or her own healing process and Reiki is a way to support this. Promote relaxation throughout your entire body and leave you refreshed and renewed. A treatment feels like a wonderful glowing radiance that flows through and around you. Think “Ahhhhhh!” Reiki treats the whole person including body, emotions, mind and spirit, creating many beneficial effects that include relaxation and feelings of peace, security and well being. Reiki has been effective in helping virtually every known illness and malady and always creates a beneficial effect. It also works in conjunction with all other medical or therapeutic techniques to relieve side effects and promote recovery. A traditional Reiki session is usually conducted with the client in a dimly lit room with soothing music playing to aid relaxation. The client is lying down on a massage table, fully clothed, while the practitioner either hovers their hands above an area or touches parts of the body when necessary. The universal life energy flows from Spirit through the practitioner’s hands to the client. It is important to note that the energy does not come from the practitioner, the practitioner is the conduit for the energy. A treatment can last from 45 to 90 minutes. It depends on what is going on in your body and my ability to connect with you energetically. Some people are more blocked than others. But the connection always takes place and when it does you will leave feeling de-stressed and refreshed. It is a wonderful experience! 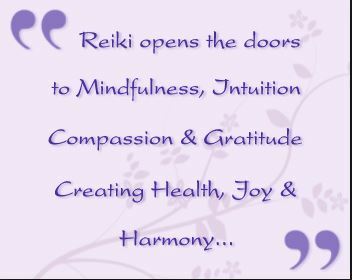 If you would like to experience the peace and contentment that a Reiki session offers, try a session for yourself. Click here to learn more about what happens during a session. Click here to purchase a session. Just for today I will not place judgment upon the actions of others.